Foxconn is the Chinese manufacturing plant so huge that it makes electronics for virtually all the big names in the tech industry you can think of, and most notably Apple. The huge plant is now undergoing change at the top management level as chief executive Terry Chang resigned for health reasons. Company vet Calvin Chih will step in as an interim chief executive until the board approves him as a permanent replacement for Chang. 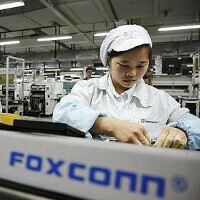 Now, Chih will take over Foxconn International, the part of the firm struggling with lower orders from Nokia and RIM, while overall Foxconn gets more orders from Apple. Does this mean a lot for you as an end-customers? The answer is likely not - Foxconn is a well-oiled machine depending on thousands of Chinese workers making gadgets and it’s famous for its ability to boost capacity by the thousands almost overnight. We also wish former exec Chang a safe recovery - he was at the head of the plant for less than 7 months, getting a comparatively very modest salary of just short of $120,000. I remember reading that, is this the same guy that said it? Even the CEO is getting sick! Much more are the employees who inhale ammonia and eat arsenic! I think it might have been because of mental health reasons. well,I hope that someone with a heart will replace him and give the workers better conditions. But is his surname gou,not chang? Another d-bag CEO that won't be missed. Anyone who runs a company where people regularly commit suicide over working conditions needs to be ashamed. What are you talking about? No has one committed suiCiDe because of any Alleged working conditions; they all committed suiCiDe because the Galaxy S III sold-out and they were forced to use Blackberrys.